J World Sailing School has 5 employees and several contractors spread out across offices in San Francisco, San Diego and Puerto Vallarta. 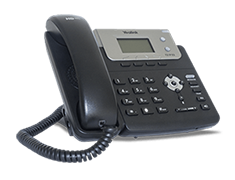 Each location has its own telephone number and operates independently. However, when staff are out of their office conducting classes or on charters, they can miss key customer calls and new business inquiries by not being immediately available to answer questions or book reservations. Using Ooma Office, J World Sailing School was able to consolidate their multiple phone numbers into one easy to use system that allowed them to centralize reservations in their San Francisco location. This enabled them not to miss a call and address customer’s questions and make more reservations. In addition, they were able to set up virtual extensions to route calls to employee’s cell phones in the field to be answered remotely. Here’s how J World Sailing School set up Ooma Office to meet their company’s needs. J World’s three phone numbers were ported to Ooma Office from the previous phone services. Each number is set to be answered by the virtual receptionist (assigned as extension 100) so all callers will hear the same message. J World sometimes prefers to bypass the virtual receptionist and route calls to the reception lobby. This can be done by selecting the Manage tab, then Phone Numbers. 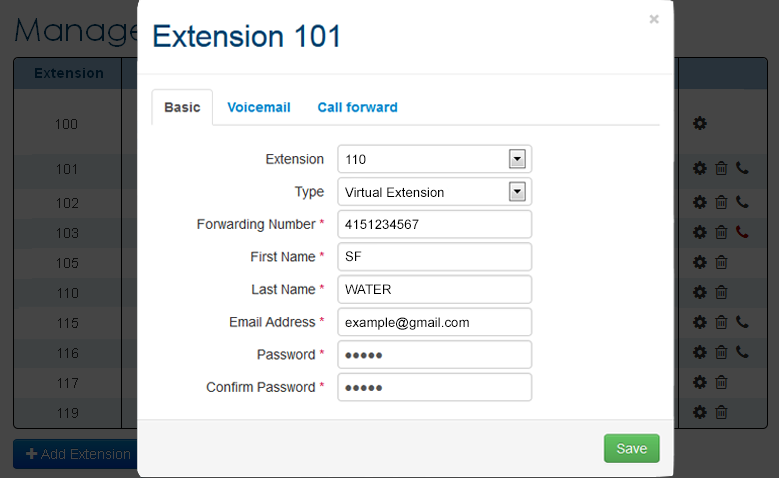 Use the pull down menu to route incoming calls to extension 115, which is assigned to the reception lobby. 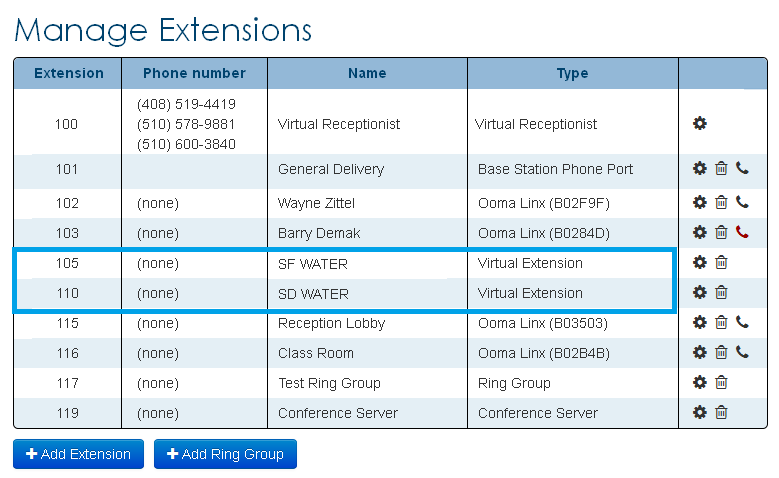 Ooma Office virtual extensions allow routing of a call to a remote employee’s mobile phone number. J World’s San Francisco and San Diego Charters are set-up as virtual extensions 105 and 110 and routed to the cell phone of the Charter Captain. 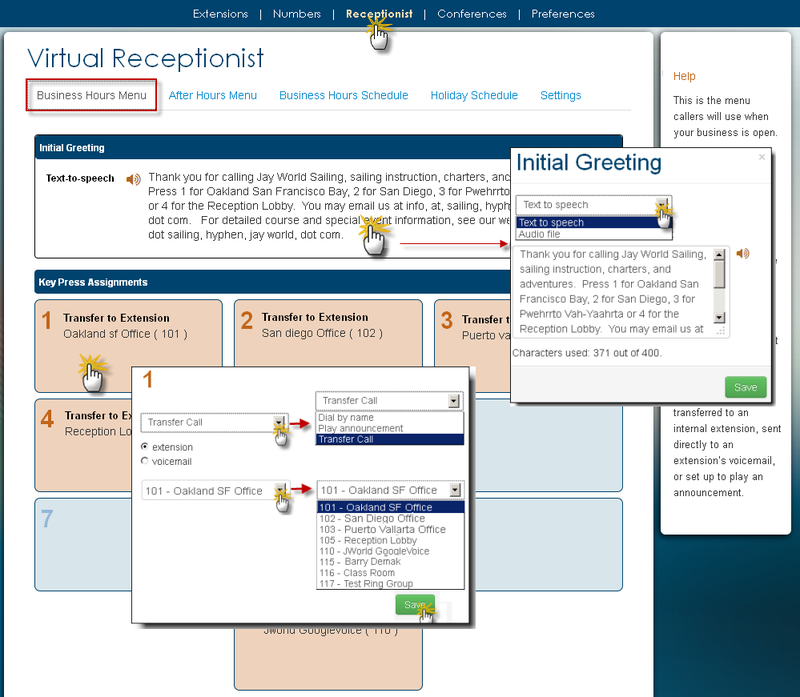 The virtual receptionist text-to-speech greeting is frequently revised by a simple click of a button. J World has the flexibility to type the changes or upload its own personal voice greeting. 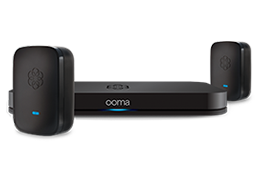 Ooma Office also allows J World to set a specific extension to either play an announcement, seamlessly transfer the call to a cell phone or select the dial by name setting.